I finally found some time to go to the Museum of Modern Art (MOMA) here in NYC. I was unfortunate to miss the “Century of the Child” exhibition (thanks a lot, Hurricane Sandy; I really wanted to see the props from Pee-Wee’s Playhouse!) 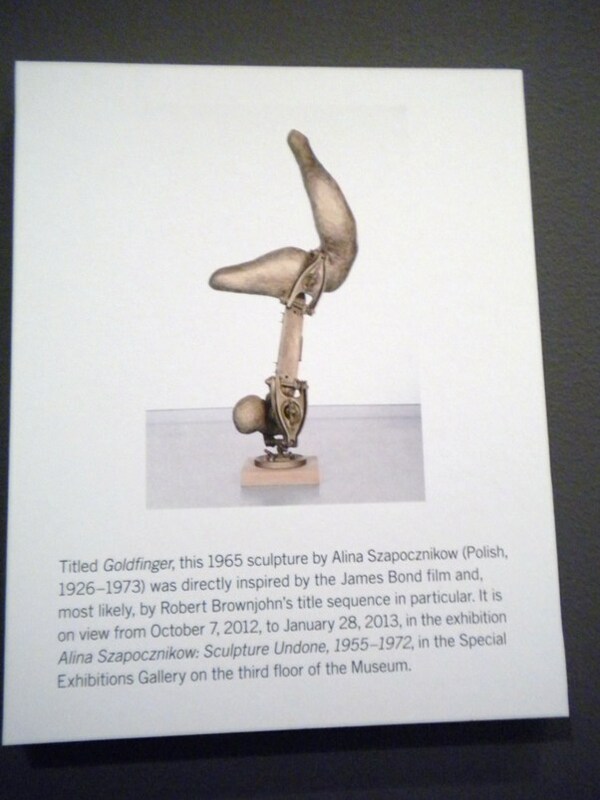 Luckily, the Goldfinger exhibition (officially called “Goldfinger: The Design of an Iconic Film Title”) was still going on. When I found it on the third floor, I have to admit that I was a little surprised by how small it was. 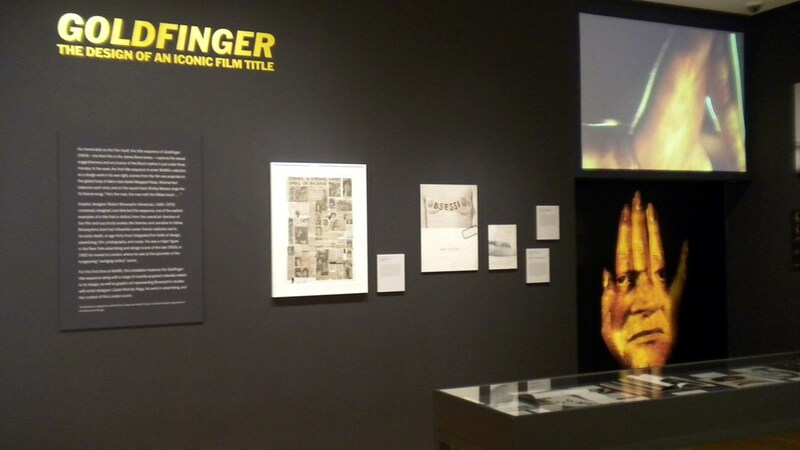 There was a screen that played the title sequence from 1964’s Goldfinger, and the rest of the artwork and photos involved the design of the title sequence. The exhibition was organized by curator Juliet Kinchin and curatorial assistant Aidan O’Connor of the MOMA Department of Architecture and Design. 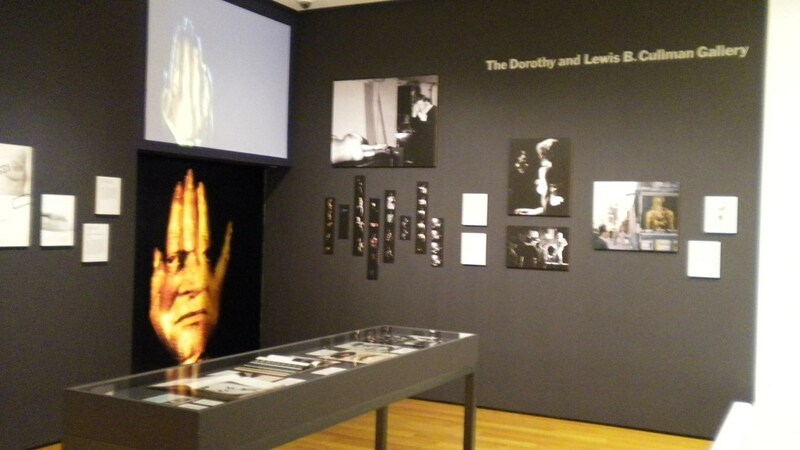 The title sequence was conceived, designed, and directed by graphic designer Robert Brownjohn (1926-1970). His title sequence was one of the earliest examples of a title that was distinct from the overall art direction of the film and succinctly evokes the themes and narrative to follow. Brownjohn had previously designed the title sequence for 1963’s From Russia With Love (the credits were projected onto belly dancing models). 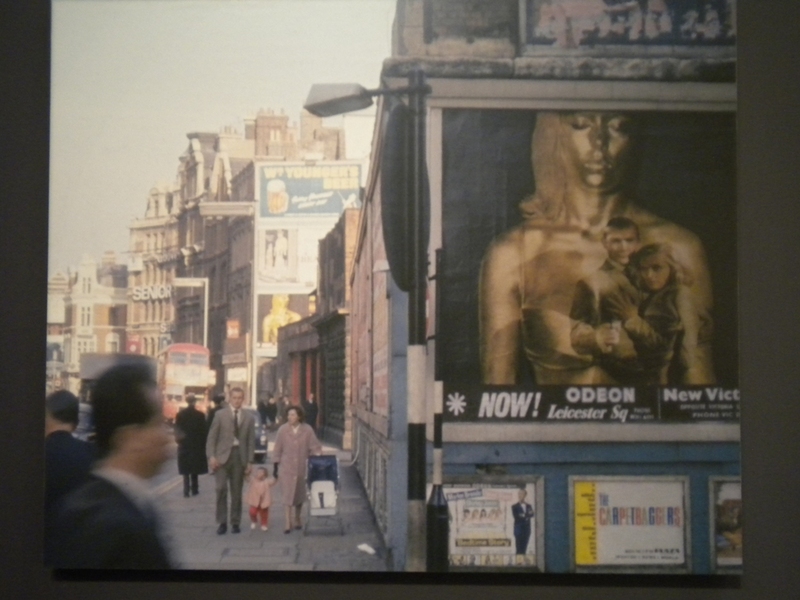 For Goldfinger, he carefully arranged projected scenes from the film with different shots and body parts of Margaret Nolan, who was gold-painted and wore a golden leather bikini. The result was a dreamscape anticipating the glamour and excitement of the film to come, and featuring blackly humorous moments like a golf ball rolling into Nolan’s cleavage and a license plate covering her mouth like a gag. 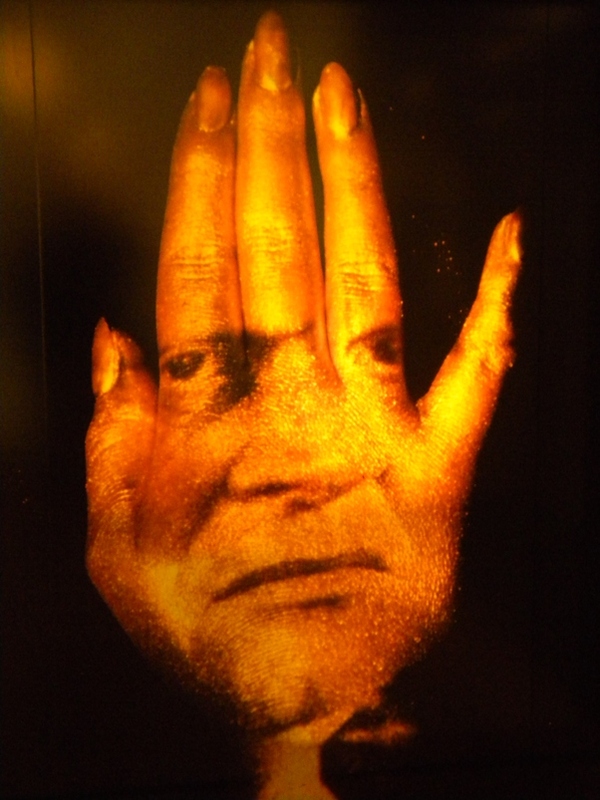 Brownjohn had experimented at length with camera angles and projected lighting in a darkened studio with Margaret Nolan in preparing the title sequence. Brownjohn preferred doing it all with the camera; he hated storyboards and scripts. Although it wasn’t as big as I had expected, I still found the exhibition quite informative and enjoyable (not to mention the fact that I took a lot of cool pictures with my camera). 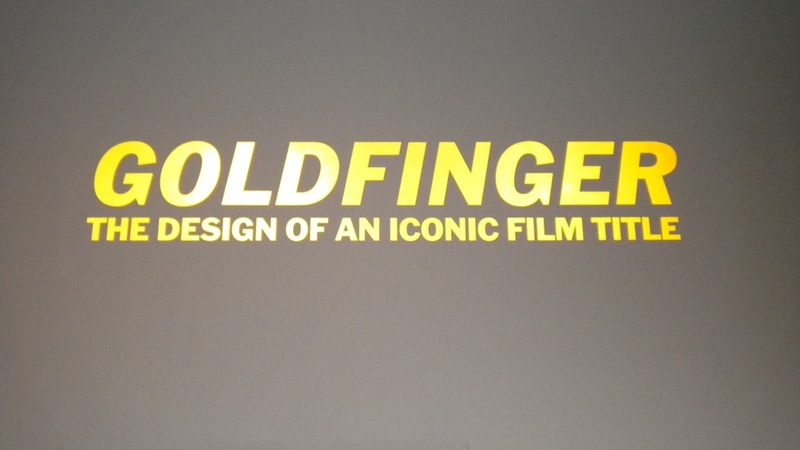 The title sequences of the James Bond films have always been creative, and Goldfinger is no exception. MOMA recently did a complete James Bond retrospective, and it was unfortunate that the only Bond film I got to see there was 1965’s Thunderball. The only other Bond films I’ve seen on the big screen are 1995’s Goldeneye (at a midnight showing at the Landmark Sunshine Cinema this past January), 2006’s Casino Royale and 2008’s Quantum of Solace (I saw both films during their respective original theatrical runs). With Skyfall having opened this weekend, I wonder what visuals will accompany the Adele song during its title sequence. Until I get to see Skyfall, perhaps I should enjoy a martini. Shaken, not stirred. Here’s to 50 years of James Bond on the big screen. 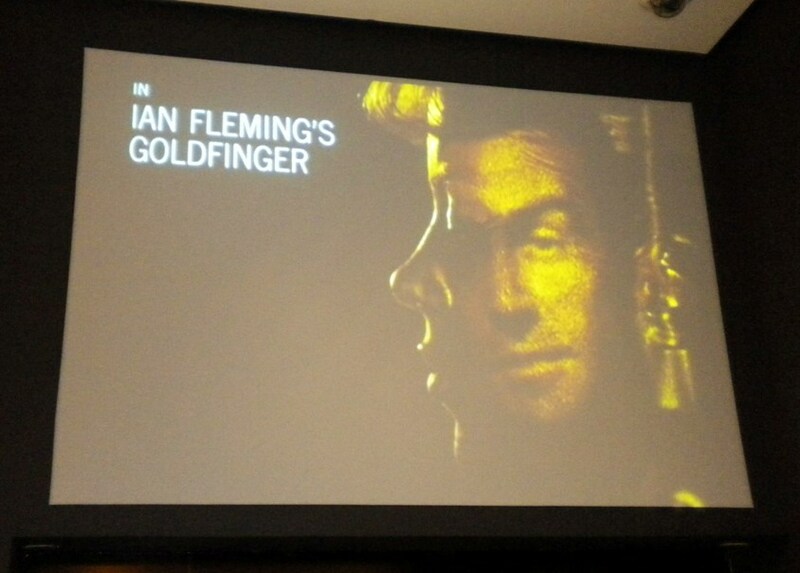 May we have another 50 years of Bond, accompanied by more creative title sequences. And thank you most of all, Ian Fleming. This entry was posted in Film Tributes, Places I Visit and tagged 50 Years of Bond, Adele, Aidan O'Connor, Casino Royale, Century of the Child, From Russia With Love, Goldeneye, Goldfinger, Goldfinger: The Design of an Iconic Film Title, Hurricane Sandy, Ian Fleming, James Bond, Juliet Kinchin, Landmark Sunshine Cinema, Margaret Nolan, MOMA, MOMA Department of Architecture and Deign, Museum of Modern Art, Pee-Wee's Playhouse, Quantum of Solace, Robert Brownjohn, Skyfall, Thunderball. Bookmark the permalink. Please sign the SaveFilm.org petition! Please check out the Hero Initiative to help comic book veterans (writers and artists) in need! Do not hesitate to donate! Find movies like the ones you love.